Puma (left) and Debo’s guardian bid on a Dog Behavior session I donated to Hands Hearts and Paws a rescue group in Omaha. 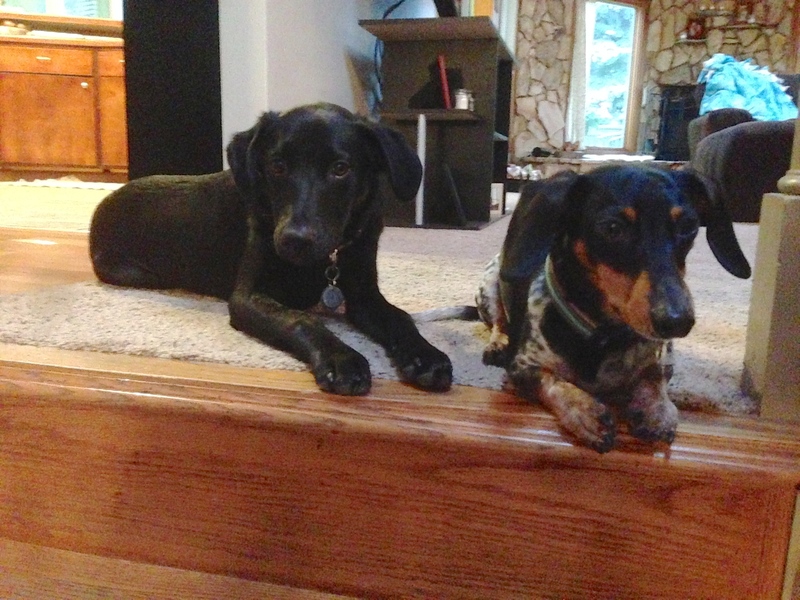 Their guardian was concerned about the two-year-old Dachshund’s nervous / aggressive behavior around young kids. When I arrived for the session, both dogs seemed nervous; Puma’s hackles were up and his body language was pretty uneven oscillating from excitement to territoriality to alerting. Debo barked with a purpose and gave me a lot of direct eye contact as he did so. It took the dogs a couple of minutes to calm down and when they did, the accomplished this by jumping on the furniture to receive attention and petting from they guardians. One of whom kept telling the dogs it was alright. I cautioned him against repeatedly telling the dogs that. First off, dogs don’t speak english so they don’t get the reference and it secondly it wasn’t working. I also advised them to never pet their dogs when they were in an excited or territorial state. When a dog is in an excited or unbalanced state and you give it attention or affection, you are essentially agreeing with that state of mind. This is a pretty common action for dog guardians to engage in when their dogs are out of balance, but it basically reinforces the exact behavior you want to stop. Instead I suggested that they disagree with the behavior by assuming a more authoritative position; standing upright facing them. To dogs, standing up with their shoulders back and chest facing the dogs is the most authoritative position a human can take. This is the “I mean business” pose. Because of all of the attention and affection given when they dogs were in an excited state, this pair of dogs was confused. Adding to the problem was a lack of rules and structure. You can get away with having no rules and structure when you only have one dog. But when you have multiple dogs, the discipline rules and structure provide becomes far more important. The combination of attention on demand and no rules or limits had given these dogs the impression they were the top dogs in the house. This is why they ignored their guardians when they attempted to disagree or correct them. Its very likely that this is a big part of the reason that Debo thinks its ok to disagree by nipping when he sees a small child doing something he disagrees with. To stop the dog’s reactions, it will be important that their guardians start to assume more of a leadership role in the dog’s eyes. I suggested some rules and limits to impose on the dogs as well as how to correct them when they violated them. It will be important that their guardians enforce these new rules consistently as soon as the dogs break them. Timing is an extremely important part of disagreeing with unwanted dog behaviors. The closer to the dog engaging in the behavior, the more effective the correction will be. I outlined a counter conditioning schedule for their guardians to use with Debo once they have mastered the new rules, limits and structure inside their home. Just like any other skill, you have to have a solid foundation before you can get to the more advanced techniques. Until the dogs see and identify their guardians as being authority figures, the counter conditioning needs to wait. By the end of the session, the dogs were pretty tired, but their behavior had improved. They did let loose a garage of barking when I got up suddenly at the end of the session, but both guardians immediately disagreed with the behavior and were able to get the dogs to stop much faster than before. In time, this structure will lead to the dogs adopting a follower mentality all the time. Once that is the case, their guardians will be able to start the counter conditioning exercises with Debo to put an end to his reaction around small children.